Canal 13 (literally in English: Channel 13), previously called Universidad Católica de Chile Televisión, also known as El 13, is the second oldest television station in Chile. It is owned by Luksic Group associated with the Pontificia Universidad Católica de Chile. Its inaugural transmission took place on August 21, 1959. Major satellite and cable providers have noted growing demand for Canal 13 to be offered in Canada. 13C Formerly called Canal 13 Cable. It offers different programming than from its parent station, with more cultural programming and more focused themes like business and sports. 13HD First HDTV channel in Chile and one of the first in Latin America, released in 2009 and available in DTV, and numerous cable TV systems. 13 Valparaíso TV station available only in Valparaíso Region and broadcast local news. 13 Concepción TV station available only in Bío Bío Region and broadcast local news. The network have 4 radio stations, but are available only in some places. Horizonte.cl is a radio station that focuses on Indie and Alternative Rock, purchased in 2012 by the network, only available online. Oasis FM radio station purchased bye the network, only available in Santiago and the south of the country. Play FM is a radio station that focuses on music in English. It also airs Spanish language music but not as frequently. Its frequency is 100.9 FM in Santiago. Sonar FM is a radio station that focuses on Rock and Hard rock music. Its frequency is 105.7 FM in Santiago and it was launched Wednesday July 29, 2009. Tele13 Radio is a news radio station which is part of the News Department of the channel. Its frequency in Santiago is 103.3 FM. 13.cl Is the brand name and home for the Canal 13 online service. It is a large network of websites including such high profile sites as Tele 13(news) and D13(sports), the on-demand video and radio services co-branded Todo 13. Canal 13 has had an online presence supporting its TV and radio programmes since 1999. Eventos 13 is the event focused division of the station, which offers special events services. Since 1961, the change to the frequency signal 13 (which remains in analog to the present). Since 1970, the logo has a thin curve with a "T" to reach the "V " and center the number "13. " Above the figure said "Catholic University of Chile" (text that appear on screen until 1978), all framed within a framework that pretended to a television screen. In 1978, with the advent of color on Chile, the number "13" is changed to the initials "UC" (referring to the university), and for a few months, used a version with a color test pattern. During the late 90's the logo was entirely virtual. This logo was the most distinctive and used by the channel, and is the same (but without the frame) that currently uses its union workers,was the favorite TV Station logo. 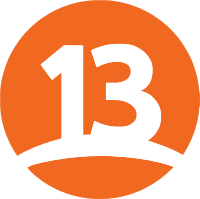 After almost 40 years, June 18, 1999, with the new administration of Rodrigo Jordan, the logo of Channel 13 undergoes a major change, from the classic "TV-UC" framed as a screen, a modern number "13 "inside a big circle with the letters" UC "(Catholic University) framed on the edge of the small. This change caused a major stir at the Pontificia Universidad Católica de Chile, as it involved a desligation of it, causing millions in losses for the channel, and the resignation of Jordan. In June 1, 2000; canal 13 inverted the logo of the Jordán administration, the UC letters come to the big circle, and the number 13 gone to the small circle. CuBox is Canal 13's children's block. The most successful soap opera of the decade was La Madrastra with 51.2 rating points and more than 70% of the share. The most successful soap opera of the decade was at the beginning of it, in 1990, it was Te Conté with 40.5 rating points and more than the 55% of share. At the end of this period, the dramatic area of Canal 13 began a crisis where it was beat by Television Nacional de Chile until 2003, where all changed. The new millennium began with Canal 13 in a crisis of the dramatic area, this problem became worse when Piel Canela in 2001, was beat by Amores de mercado of Television Nacional de Chile with 11.3 v/s 46.9 respectively. In 2003, the crisis end with Machos premiere which in the first weeks was beat by Puertas Adentro, but in mid-April won to the production of the TVN being the first time since 1993. Then, in 2005, Brujas won to Los Capo, with 37.5 v/s 14.5. ↑ "Canal 13 details". Amarillas.com Mercantil.com chilnet.cl. Retrieved 29 January 2013. ↑ Grupo Copesa (September 28, 2012). "Tribunal de Defensa de la Libre Competencia autoriza a Canal 13 para comprar radios Horizonte y Oasis". latercera.com. ↑ "Canal 13 Corporativo "Our History"". 13.cl. Retrieved 29 January 2013. ↑ "Catalina Pulido: "Me gusta ser cruel"". estrellavalpo.cl. ↑ Grupo Copesa (June 28, 2013). "Mundos Opuestos 2 termina como uno de los reality menos vistos de Canal 13". latercera.com.